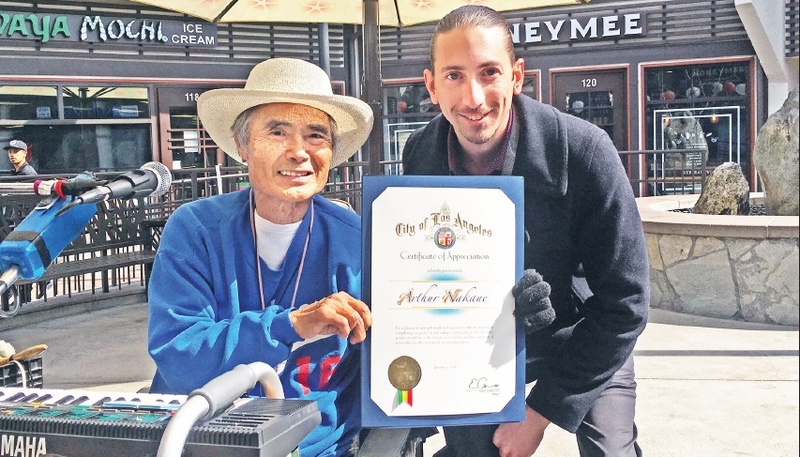 Longtime musician Arthur Nakane receives a Certificate of Appreciation, signed by Mayor Eric Garcetti and delivered by David Abbott of the Los Angeles Geographic Information System Department. After eight years of entertaining crowds in Little Tokyo’s Japanese Village Plaza, some high praise has come to musician Arthur Nakane. A Certificate of Appreciation, signed by L.A. Mayor Garcetti, was delivered to Nakane, who was performing his iconic one-man band music in Little Tokyo on Feb. 28. “Completely surprised,” said the disbelieving entertainer. “When this man came on to the stage and said he was from City Hall, I honestly thought he was going to shut down my performance there,” he confesses with a laugh. Five years ago, the city banned for two months all the music at the popular plaza, after someone complained that the sounds of their weekly karaoke shows and some invited bands were too loud. David Abbott of the city’s Geographic Information System Department, who saw Nakane perform and did some research on the musician’s life and achievements before recommending him to the mayor, presented the 11-by-17-inch certificate as the show audience gave a round of warm applause. A native of Japan, Nakane came to L.A. in 1963 to study. Encouraged by the owner of the Crenshaw district restaurant Kabuki, he soon started his music career as a singer-guitarist. Eventually he got married and became a full-time musician to support his growing family while attending school. After 11 years of off-and-on study, he finally graduated from California State University at Los Angeles and became a high school teacher. In order to supplement his salary, he continued playing music and to compete with other musicians for jobs, he developed a unique one-man band, playing several instruments simultaneously. A professional translator and interpreter for some 40 years, Nakane has translated over 200 Japanese songs into English, introducing them to non-Japanese-speaking audiences. He performed in Santa Monica for 20 years, earning more fans there, but his request to perform at the Japanese Village Plaza was turned down by all the former owners for 30 years. He finally received approval to perform eight years ago from the new management. “Fish back in the water,” he quipped. Currently, Nakane performs on Sundays, Mondays and Tuesdays at the Village Plaza and also Fridays and Saturdays at Weller Court in Little Tokyo. “I feel so gratified being appreciated by so many people, young and old, of all races,” said the grateful performer. Four and a half years ago he slipped and fell in his own bathroom, seriously injuring his neck. The accident paralyzed his entire body. Despite being burdened by his dysfunctional fingers and legs and with slurred speech, he still manages to do all the set-ups and break-downs and delivers his show while sitting in his power wheelchair. “I depended on my hired assistant for one year, but for the past two years I have learned to do everything by myself. It takes three times longer,” reveals the struggling Nakane. “But I don’t want to lose the spirit of independence and my self-esteem,” says the proud musician. Nakane celebrated his 81st birthday in February.